Ryan Farquhar won the inaugural Lightweight race for Supertwin machines at the Isle of Man TT in 2012, beating James Hillier (left) and Michael Rutter. Ryan Farquhar says the ascension of the humble Supertwin has silenced its critics with many of road racing’s top names now embracing the class. The KMR Kawasaki team boss was the driving force behind the introduction of the 650cc machinery at Irish road race meetings and is regarded as an ambassador for the Supertwin racing, which has filled the void left by the demise of traditional 125cc and 250cc two-stroke motorcycles. Race winner Ryan Farquhar, runner-up Jeremy McWilliams (right) and Michael Rutter secured a KMR Kawasaki podium clean sweep in the first ever Supertwin race at the North West 200 in 2012. Today, Supertwins are also an integral part of the race schedule at the major international road races such as the North West 200, Isle of Man TT and Ulster Grand Prix. In 2009, Farquhar won the inaugural Supertwin race at the Ulster Grand Prix, beating a field of 13 unfamiliar names. The runner-up – Lee Hill – was 37 seconds adrift at the finish. 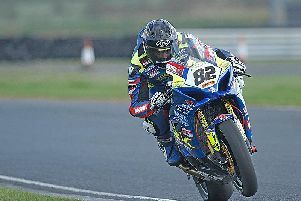 Three years later, he triumphed in the first running of the Supertwin class at the North West 200. On this occasion, he led home a KMR Kawasaki 1-2-3, with the esteemed Jeremy McWilliams and Michael Rutter joining him on the rostrum. Less than a month later, the Dungannon man became the first winner of the Lightweight race for Supertwin machines at the Isle of Man TT. James Hillier finished as the runner-up followed by Rutter and Aussie Cameron Donald, underlining the improvement in the depth of quality in the field since those early developmental years. In June, 18-time TT winner Michael Dunlop claimed his first Lightweight TT victory on a factory Paton, setting a lap record of 122.750mph to see off Mullingar’s Derek McGee, who finished second on one of Farquhar’s Kawasaki machines. Mullingar man Derek McGee celebrates his runner-up finish in the Lightweight race at the Isle of Man TT in June with the KMR Kawasaki team. The success of the class is a source of great pride for Farquhar, who has concentrated on running his team since he suffered life-threatening injuries in a crash at the North West 200 in 2016. “Really it all started nine or ten years ago, when I was really starting to push the class. A lot of people laughed at me back then but now you’ve got Supertwin racing all over the world,” Farquhar said. “We’re sending parts to America, Canada, Switzerland and Belgium – you name it and we’re sending stuff there, with people wanting to buy bits and pieces off me. It started as a bit of fun but the class has grown massively over these past years. “There are still people who make light of the Supertwin – even on the National scene – but you only have to look at the lap times now at the likes of the TT to see how much they have come on. These bikes started out as commuter bikes, the kind of thing you’d go to the shops on, but we’ve developed them now to the stage where these are the kind of lap times they are capable of,” he added. “I don’t think we are done either. I know with the bike I have now, I’d imagine we could definitely be at least 1mph faster next year. Back in the day, if you were able to complete four laps at the TT on a 250 at 118mph, you wouldn’t be far off winning the race. “Nowadays in the Supertwin class, four laps at 118mph wouldn’t get you into the top 15. A 250 should be able to lap faster because they have better top-speed and they are much lighter. Jeremy McWilliams rode for Farquhar at the Sunflower Trophy meeting last weekend at Bishopscourt, finishing second behind Glenn Irwin in race two after sliding out of the opener. Essentially, the short circuit meeting was a shakedown for the 2019 road racing season for the KMR team, when Farquhar once again hopes to run a number of machines at the international meetings. “I’d love to be on the grid again next year and Derek (McGee) is keen to go again. Hopefully we can get sponsorship on board because it takes a lot of money to run a few bikes over the course of a year,” he said.